Their IS no home security without privacy. Once a tyrannical state knows your every move, they can come up with any excuse to lock you away. The NKVD under Genrikh Yagoda, Nikolai Yezhov, and Lavrenti Beria depended primarily upon human informants - "stukachi" - for information about "enemies of the State". Now our own phones and computers, at home, at work, and on our very persons, are being used to betray us. So...do you agree or disagree with the cartoon's point (NSA claims of anti-terrorism measures is actually dire destruction of privacy)? 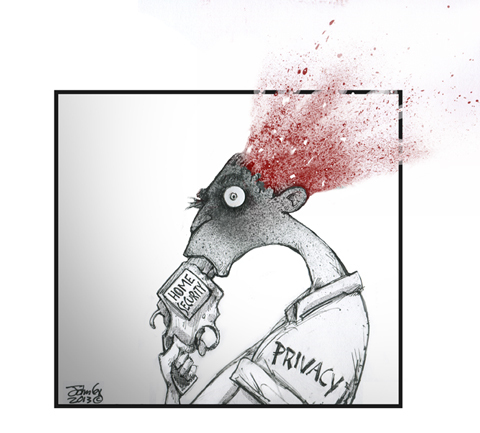 I agree with the cartoon's point of the dire destruction of privacy. And as to one apologist's argument that all the NSA did was collect "metadata", well, Sun Microsystems engineer, Susan Landau, argued that metadata can reveal a lot more than a mere wiretap. Ms. Landau said that "The public doesn’t understand. (Metadata is) much more intrusive than content.” By revealing who you called, from where you called, and when, the government can gain a lot more proprietary information about you and the people you called than from the mere content of a call. Beria, Yezhov, Yagoda, and "Iron Feliks" Dzerzhinsky (head of the Cheka) would be so jealous of the NSA's capabilities. Disturbing image. How did a guy who didn't have a boat end up in the middle of a dismal swamp--more than a mile away from his car--with clean, dry shoes--including the soles? Secure the borders, enforce immigration laws, prohibit the immigration of terrorists, & boot out the ones here. Eliminates the need for dragnet monitoring/control... or a never-ending chain of amnesty bills. Having worked for NSA as an analyst while in the service, a whole lot of "little things" can tell you quite a lot of big things. This page contains a single entry from the blog posted on June 12, 2013 12:26 AM. The previous post in this blog was Enhance Your Life!.